..:: Nurturing Latent Talent ::..
Games or sports if missed is a great deal to a child’s growth. Physical activity stimulates growth and leads to improved physical and emotional health. Our wide play ground and coaching provides an excellent chance for children to play the games they like. 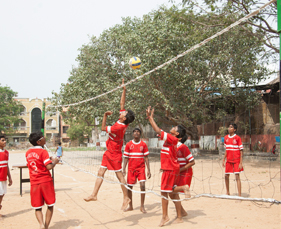 We have specialist Coach for Volley ball,cricket, Kho kho, Basket Ball. There are tens of students who have represented our school at district and state level tournaments in volley ball and kabaddi. Carroms, Chess and other Indoor games are also introduced to the kids from a very young age at our school. Annual Sports day and its Celebrations give us a great joy as we witness the future stars from the school. The posture of Nataraja statue in our art room looks like he is happy witnessing the artistic progress and aesthetic sense of our students who are going to be the cultural face of our country giving performances on diverse platforms in the coming days. Classical, Western and other dance forms are introduced to the kids of all age groups depending on the performing abilities. Experienced teachers identify and nurture the talented students and provide them multiple opportunities to perform and exhibit their talent to different groups. Classical Vocal and Light music lessons relax the students from the schedules and help them regain focus on core activities. Drawing and Painting , the most favorite pass time of every kid is carefully presented with a touch of professionalism to bring out the creative genius. We have adapted the latest trends in the academic industry which shall produce quality manpower for various industries in times to come. Mob: +91 9246 10 4223.